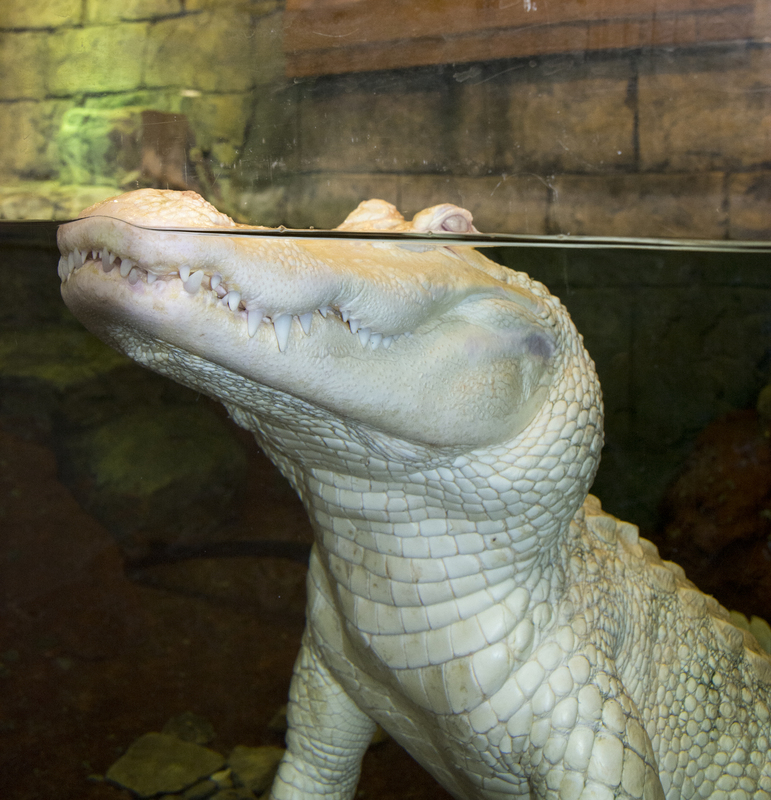 NEWPORT, Ky. – Time is running out for Newport Aquarium guests to see in person two extremely rare albino American alligators and to take advantage of one of the aquarium’s best offers of the year. Snowball and Snowflake – two of less than 100 white alligators in the world – will be moved off exhibit the evening of Feb. 28, 2014, in preparation for their return to Wild Adventures Water & Theme Park in Valdosta, Ga.
Additionally, Feb. 28 represents the last day for guests to take advantage of Newport Aquarium’s Winter Family Days special, when two children 12 and under are admitted FREE* with the purchase of one non-discounted adult ticket. Surrounded by Sharks – Guests can walk through a 385,000-gallon tank filled with rare and exotic shark ray, as well as tiger sharks, zebra sharks, stingrays, and a curious 200-pound loggerhead sea turtle named Denver. Gator Alley – Showcasing eight species from four continents, Gator Alley is one of the most diverse collections of crocodilians in the country. It’s also the home of Mighty Mike – who at 14 feet and 800 pounds is the biggest and baddest alligator in the country outside of Florida. Frog Bog – The Frog Bog is the largest exhibit of its kind in the Midwest with nearly 20 species of exotic frogs. Children can find secret frog tanks visible only when they climb through tunnels and tubes in our kids-only Frog Bog jungle gym. Jellyfish Gallery – With more than 100 jellyfish on display, guests can marvel at the largest and coolest jellyfish exhibit in the Midwest. Winter Family Days tickets are available at the Newport Aquarium ticket window, at NewportAquarium.com, or by calling toll-free 800-406-FISH (3474). Newport Aquarium, the No. 1 aquarium in the country according to USA Today’s 10Best.com, is located in Newport, Ky. across the Ohio River from Cincinnati, Ohio. Newport Aquarium was named a 2013 top U.S. aquarium by Travel Channel. A leading tri-state destination, the state-of-the-art facility is an accredited member of the Association of Zoos & Aquariums, a leader in global wildlife conservation. This entry was posted in Uncategorized and tagged White Gators, Winter Family Days by NewportAquarium. Bookmark the permalink.